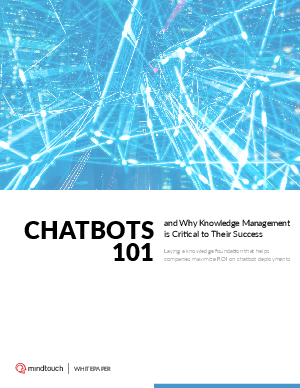 Chatbots are hungry and knowledge management is the secret sauce. Chatbots are all the rage. They help customers find information and answers. They help contact centers automate tasks and create considerable efficiency gains. How, then, do organizations ensure their chatbots consistently deliver A+ experiences? The answer is knowledge management. Without the availability of rich, relevant content, chatbots have very little to work with during customer interactions. They won’t be able to accurately match user intent with the right information. And that’s no good for the customer. How knowledge management changes all that is the topic of our latest whitepaper.